Bangladeshi opposition leader Khaleda Zia has called on her supporters to enforce a transport blockade after four protesters were killed in clashes with police and pro-government crowds. She urged members of her Bangladesh Nationalist Party (BNP) to halt road, rail and river transport indefinitely. The deaths came on the first anniversary of disputed general elections won by the Awami League. Both parties have called for rallies despite a ban on demonstrations. Security forces are preventing Ms Zia from leaving her party offices in the capital Dhaka. Police say they want to stop violence. "Not only am I prisoner, but the whole of the country is being held captive. What kind of country are we living in?" Ms Zia said from her office. The opposition leader was forced to issue her call for mass protests from inside the premises, having been stopped from leaving since police cordoned off the area on Saturday night. Ms Zia and her arch rival, Prime Minister Sheikh Hasina, have frequently called for general strikes and blockades when in opposition. The prime minister for her part accused the BNP of trying to create chaos in its efforts to overthrow the government. "I am urging the BNP leader to stop these bomb and grenade attacks, these acts of sabotage, and killings, of arson and damage to property," she said in a televised address to the nation. On Monday, the authorities parked trucks laden with sand and bricks outside her office in what correspondents say was an effort to prevent her from spearheading anti-government protests in person. While the opposition leader was barred from leaving her offices, armoured vehicles equipped with water cannon also stopped her supporters from entering or leaving. Thousands of riot police have been patrolling almost deserted streets in the capital. Authorities had cancelled bus, rail and ferry services into the city to prevent mass rallies. Violence broke out in various parts of the country. 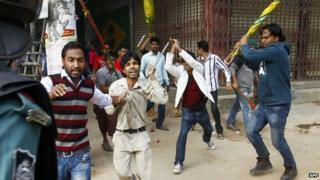 Two BNP activists were killed in the northern town of Natore, police said. In nearby Kansat another protester was killed in clashes with police. A fourth died when police fired live rounds at crowds in northern Rajshahi district. A number of people have been injured in clashes in the capital and about half a dozen other towns, reports say. The BNP and other opposition parties boycotted last year's election, saying it would be rigged. They were angry that Sheikh Hasina, who has been in power since 2009, refused to stand aside to make way for a neutral caretaker administration to oversee the election. Dozens of BNP workers have disappeared since last year's election, with human rights groups blaming the government - although it denies this. An adviser to the prime minister insisted on Sunday that Ms Zia had not been locked up but had been given "enhanced security protection". The two leaders have alternated in power for most of the last two decades when the army has not been in government. Who belongs to the worldwide club of women leaders?